What is the NOW Function? The NOW function is categorized under DATE/TIME functionsFunctionsList of the most important Excel functions for financial analysts. This cheat sheet covers 100s of functions that are critical to know as an Excel analyst. The function returns the current date and time. In financial analysisFinancial Analyst Job DescriptionSee a real Financial Analyst Job Description including all the skills, experience, and education required to be the successful candidate for the job. Perform financial forecasting, reporting, and operational metrics tracking, analyze financial data, create financial models, the NOW function can be useful in preparing various KPI reports. We can use it to display the current date and time, as it will continually update each time the worksheet is refreshed. For example, every time a value is entered or changed NOW will update the date and time. If we want, we can use F9 to force the worksheet to recalculate and update the value. The NOW function takes no arguments and requires only empty parentheses. The value returned by the function is a serial number representing a particular date and time in Excel. How to use the NOW Function in Excel? Sometimes when we want to display the current date and time in a worksheet, we can use the NOW function. The date and time will update whenever the worksheet is recalculated or opened. To do that, we need to just insert the formula =NOW() in the cell where the current date and time should appear. 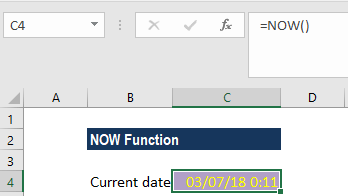 In the example above, the current time that is returned by the NOW function is subtracted from the appointment time and the result is compared against the value 1/24, which is the value of 1 hour in Excel. If the current time is less than 1 hour from the appointment time, the alert is displayed; otherwise the text “Not yet due” is displayed. Remember that the above appointment alert will only work if our spreadsheet is continually updated. While the spreadsheet is unused, the content of cells B4 and C4 will stay the same as at the last evaluation. If we want to display the date only, we can format the cell with a date format that does not display time, or we can use the TODAY function, which only inserts the date component. If we want to insert the current date and time in a way that they will not change, we need to use the keyboard shortcut Ctrl + ‘ (press all 3 keys together). The shortcut will insert the current time in a cell as a value that will not automatically change.